Draft: 1992, Oakland Athletics, 2nd rd. Full name JASON GILBERT GIAMBI…Married, Kristian...The couple had their first child, daughter, London, on 11/5/11...Graduated from South Hills High School (1989) in West Covina, CA...Lettered three seasons in baseball, three in basketball and two as a quarterback in football earning all-league honors in each sport...Drafted by Milwaukee (43rd round) out of high school but elected to attend Long Beach State University where he played baseball and majored in business...As a sophomore led the Big West Conference in hitting with a .407 average and for his college career hit .397...Was a member of the 1991 All-College World Series team....Was a member of the bronze medal winning U.S. baseball team at the 1991 Pan Am Games in Havana, Cuba, and a member of the U.S. Olympic club that competed in Barcelona in the summer of 1992...Is a spokesman for CAP Cure which helps raise money and awareness in the fight against prostate cancer...Received the Dave Stewart Community Service Award and the Fred Hutchinson Award in 2000. Made the club out of spring training and led the club with 54 starts at designated hitter...Oldest position player in the American League, third overall behind Mariano Rivera and Darren Oliver...Started the year on the Major League DL (lower back strain) and was added to the roster on April 12...Hit career home runs #430 on April 17 vs. Boston, becoming the third oldest Indians hitter to homer in a game...Hit career double #400 on June 26 at Baltimore...Became the oldest player in MLB history to hit a "walk-off" home run on July 29 vs. Chicago-AL off Ramon Troncoso, his 9th career game-ending home run and his 10th career pinch-hit home run...According to the Elias Sports Bureau, the record was previously held by Hank Aaron in 1976 for Milwaukee (Giambi was 45 days older than Aaron at 42Y.202D)...Also hit a pinch-hit, game-ending home run on Sept 24 vs. the White Sox (Addison Reed), topping his own record for oldest career game-ending home run (42Y, 259 days) with his 10th career walk-off home run, his 11th career pinch-hit home run and his 6th career pinch-hit walk-off HR, most in MLB history and 3 more than any other player ...Jason is the only active player with a walk-off home run for 4 different teams (Athletics, Yankees, Rockies, Indians)...His 3 pinch-hit HR this year tied the single-season club record...Collected his 2000th Major League hit on Sept 8 vs. the New York Mets off LaTroy Hawkins....Recorded an at bat/RBI ratio of 6.0 in 54 starts at DH (team-high)...Hit his 9th career pinch-hit home run on May 27 at Cincinnati...Struggled over the last few months of the season, hitting .148 (12-81) from July 3 until the end of the season...Hit .213 (17-80) with runners on base with 16 walks and a .797 OPS. Returned to Colorado for third-plus season (since September 2009) in 2012...Spent time on DL with viral illness following All-Star break...Only HR was a pinch-hit walk-off HR on 5/2 vs. the LA Dodgers…It was his 8th career pinchhit HR and 5th pinch-hit HR as a Rockie…Was also his 8th career walk-off HR. Played his entire 16th Major League season on the Rockies active roster as a back-up first baseman andpinch-hitter...Played in 87 games for the Rockies, logging 35 starts at first base, 44 games as a pinch-hitter and anothereight starts as the Rockies designated hitter in American League parks during Interleague play...Finished third on the team with his 5.03 at-bats per RBI ratio (176 ab, 35 RBI) behind Troy Tulowitzki (4.95)and Carlos Gonzalez (5.03)...his season number finished not far off his career AB/RBI ratio of 4.98...Was at his best with runners on base, and in scoring position in 2010...batted .291 (25-for-86) with fivehome runs and 34 RBI with runners on base and .362 (17-for-47) with 28 RBI with runners in scoring positionin 2010...had 19 walks and just eight strikeouts with RISP...those numbers compare to a .200 (18-for-90) average with none on...Two of his six home runs were walk-off shots...capped the Rockies three-run 9th on 6/23 vs. BOS witha two-run walk-off home run off Jonathan Papelbon...also hit a walk-off home run on 9/12 vs. ARI off SamDemel, giving the Rox a 4-2 win...both walk-off homers were pinch-hit appearances...Moved up 10 places on the MLB all-time RBI list in 2010 with his 35 RBI this season...is now tied for 77thon the all-time list with Garrett Anderson and Hall-of-Famer Orlando Cepeda...passed Hall-of-Famer'sCarlton Fisk (87th), Duke Snider (85th), Johnny Mize (83rd) and Brooks Robinson (80th) on the list in 2010...Climbed five spots on the MLB all-time walks list from 47th to 42nd by drawing 35 free passes this season...Giambi passed Hall-of-Famer Al Kaline (44th) on the way to his current standing at 42nd alltime...he needs five more walks to tie Hall-of-Famer Luke Appling for 41st on the all-time list...he alsoneeds nine more walks to pass Fred McGriff and move into the top-40 on the list...Giambi also ranks 43rd on the MLB all-time home runs list with his 415 career clouts...he passed DarrellEvans (414) in 2010 and is now 11 home runs shy of Hall-of-Famer Billy Williams on the list. Agreed to terms on minor league contract with Coloradoon August 24 and was assigned to Triple-A Colorado Springs...wasadded to the active roster on September 1 and appeared in 19games for the club down the stretch...made 4 starts, all at firstbase...finished the season 9-for-last-20 (.450), 3 HR's, 11 RBI, 5walks in his last 25 pinch plate apps...hit .292 (7-for-24) with 2 homeruns, 11 RBI and 7 walks in 19 games for the Rox after joining theclub 9/1...had an immediate impact on the National League playoffrace, as he supplied game-winning hits in each of his first 2 gameswith the club, both as a pinch-hitter and both in the 8th inning...on9/2, his pinch-hit 2-RBI single in the bottom of the 8th inning gave theRox the lead in a 5-2 win vs. the Mets...on 9/4, his pinch-hit RBI singlein the bottom of the 8th inning again gave the Rox a 5-4 win vs.the D-Backs...hit HR's, 9/19-20; hit 4th career pinch-HR 9/19 at ARI(Schoeneweis)...pinch-hit 9th inn. single 9/25 set up game-winning,walkoff sac fly...hit .444 (8-for-18) with 4 RBI and 6 walks in 6 gamesat Triple-A Colorado Springs before joining the club; had homers inback-to-back games, 8/29-30...prior to joining the Rockies organization,Giambi hit .193 (52-for-269) with 11 home runs and 40 RBI in83 games for the Oakland Athletics...he played 58 games at firstbase before being released by the club on August 7...prior to beingreleased Giambi was on the 15-day day disabled list (July 20-August7) with a strained right quadriceps...he signed as a free agent withthe A's on January 8, 2009...made his 14th career Opening Day start, his seventh with the A's. Hit .247 with 19 doubles, 32 home runs and 96 RBI in 145 games with the Yankees...made 112 starts at first baseand 26 at designated hitter...those were his most starts at first with the Yankees and his most since 2001 withOakland (136)...had made just 80 starts at first combined over the previous two years...ranked second on the teamin home runs after hitting just 14 in 2007...recorded his eighth career 30-homer season, reaching double-digits inhome runs for the 13th consecutive year...ranked second in the American League with an average of 14.3 at batsper home run and 4.8 at bats per RBI...tied for third in the AL with nine sacrifice flies...was tied for eighth in theAL in home runs...of his 32 home runs, 15 either tied the game or put the Yankees ahead...41 of his 96 RBI eithertied the score or gave the Yankees the lead (42.7%), the third-highest percentage of lead-changing RBI in the ALthis season behind Oakland's Jack Cust (44.2%) and Emil Brown (44.1%)...led the AL with 22 hit by pitches andhad 109 as a Yankee, joining Derek Jeter (138) and Frank Crosetti (114) as the only players in franchise history withmore than 100 hit by pitches...as a first baseman, batted .243 with 24 HR and 77 RBI, ranking third in the AL at theposition in home runs, fourth in on-base percentage (.359), fifth in slugging percentage (.485) and sixth in RBI...hit.247 with six home runs as a DH. Hit .236 (60-for-254) with 31R, 8 doubles, 14HR, 39RBI and 40BB in 83 games with the Yankees in 2007 (53 starts at DH, 16 starts at 1B)... Ranks ninth in the Major Leagues with 318HR over the last 10 years (1998-2007) and 11th over the stretch with 998RBI... Made 11th career Opening Day start in 4/2 win vs. Tampa Bay, going 2-for-5 with 3RBI, including game-winning RBI single in the seventh inning... Hit game-winning solo-HR (#2) in the 13th inning and was 1-for-6 in 4/14 win at Oakland...according to the Elias Sports Bureau, it was the ninth extra-inning home run of his career, tying him for third-most among active players behind Barry Bonds (11) and Sammy Sosa (10)... Hit safely in a season-high 10 consecutive games from 4/13-23...hit ...15 (17-for-41) with 7R, 3HR and 10RBI during the streak...drove in at least one run in six consecutive games from 4/18-23 (9RBI overall)... Missed three games from 5/9-11 with a bruised left foot... His ninth-inning single in 5/16 Game 2 win at Chicago (AL) snapped an 0-for-20 stretch... Hit solo-HR (#7) and was 2-for-4 with 1SB in 5/29 loss at Toronto...was his first stolen base since 7/14/06 vs. CWS... Was placed on the 15-day D.L. from 6/1-8/7 with plantar fasciitis and a partial tear of the plantar fascia of the left foot (missed 61 team games)...was batting .262 (39-for-149) with 19R, 5 doubles, 7HR, 23RBI and 25BB in 45G/42GS (40-DH/2-1B) prior to the injury... Was returned from rehab assignment and reinstated from the 15-day D.L. on 8/7...made eight rehab starts with Single-A Tampa from 7/28-31 and Triple-A Scranton/Wilkes-Barre 8/3-5, hitting .227 (5-for-22) with 1R, 1 double, 1HR, 2RBI and 9BB...hit .111 (1-for-9) with 1R, 1HR, 1RBI and 6BB in 4GS (2-1B/2-DH) with Scranton/WB...hit .308 (4-for-13) with 1 double, 1RBI and 3BB in 4GS at DH for Tampa... In his final 38 games following his return from the D.L. on 8/7, hit .200 (21-for-105) with 12R, 3 doubles, 7HR, 16RBI and 15BB...made 14 starts at first base and 13 at designated hitter... Hit pinch-hit solo-HR (#8) in the ninth inning of 8/11 win at 11 win at Cleveland (off Edward Mujica), his first home run since 5/29 at Toronto...was his first career regular season PH home run... Hit two-run HR (#9)-his second HR in as many games-and was 2-for-4 in 8/12 win at Cleveland...was one of two times this season that he homered in consecutive games (also on 4/18-19 vs. Cleveland)... Recorded his only multi-HR game of the season and the 35th of his career (all 2HR games) in 8/17 win vs. Detroit , hitting two solo-HR (#10, 11 off Nate Robertson and Aquilino Lopez)... Hit his 12th career grand slam (off Shaun Marcum) and was 1-for-3 with a season-high 4RBI, in 9/11 win at Toronto... Missed two games (9/18-19) with a bone bruise in his right foot...was hit in the foot by a pitch from the Orioles' Daniel Cabrera on 9/17... Hit safely in four of his last nine games to close out the regular season (.179, 5-for-28). Improved upon his "Comeback Player of the Year" numbers of a year ago, hitting .253 (113-for-446) with 92R, 37HR, 113RBI and 110BB in 139 games with the Yankees (70 games at designated hitter, 64 starts at first base)...ranked second in the American League with 110 walks and 21 hit by pitch, tied for sixth with a .413 on-base percentage, seventh with 37 home runs and a .558 slugging percentage, and tied for ninth with 113 RBI...Drove in 113 runs on 113 hits in 2006, becoming only the second player in Major League history to record as many as 100 RBI while posting as many or fewer hits (also Mark McGwire - 147RBI on 145 hits in 1999)...over the last 10 seasons (1997-2006), ranks seventh in the Major Leagues with 1,040 RBI...was named the American League "Player of the Week" for the week ending 4/16...led all A. L. batters by hitting .571 (8-for-14) with 4HR, 10RBI, a 1.571 slugging percentage and a .700 on-base percentage...also drew five walks, scored six runs and collected 22 total bases over five games to win the third weekly award of his career and first as a member of the Yankees...Was named the American League "Player of the Month" for April...in 22 games, hit .344 (21-for-61) with 17 runs, 9HR and a league-leading 27RBI...he also led the league in walks (26), slugging percentage (.852) and on-base percentage (.554)...was his sixth career "Player of the Month" Award, his fourth as a Yankee...was 1-for-3 in 5/15 loss vs. Texas before being removed defensively in the eighth due to stiff neck...his first-inning single snapped an 0-for-17 stretch...did not play in 5/16 win vs. Texas (stiff neck)...Hit 11th-inning game-winning home run on 5/30 at Detroit (#13), his fourth extra-inning home run as a Yankee...the home run snapped a 62-at-bat homerless stretch...according to the Elias Sports Bureau, it was his second-longest HR drought as a Yankee (went 70 straight ABs without a HR in 2004)...missed two games (6/3-4 at Baltimore) with viral stomach disorder...hit three-run HR (#16)-his third homer in last three games and fourth in his last five-and was 1-for-2 with 2R and 3BB in 6/5 win vs. Boston before being removed for PR in the seventh...Hit safely in a season-high 10 straight games from 5/24-6/5, batting .390 (16-for-41) with 12R, 4HR and 11RBI during the streak...was his longest such streak since hitting in 10 straight games from 7/7-19/02...missed two games (6/11 vs. Oakland and 6/13 vs. Cleveland) with bruised left hand...led the Majors in June with 11HR while leading the team with 23RBI...hit two-run HR (#21) and three-run HR (#22) and was 2-for-4 in 6/26 win vs. Atlanta. According to the Elias Sports Bureau, his homer in 7/1 win vs. NY Mets was his 51st home run since July 1, 2005, tying Boston's David Ortiz for the most home runs in the Major Leagues during that 12-month period (July 2005 through June 2006)...hit 25HR over the Yankees' first 81 games of the '06 season...since 1961, the first year that the American League played a 162-game schedule, only three other Yankees hit 25-or-more home runs in the team's first 81 games of a season: Tino Martinez (27 in 1997), Roger Maris (32 in 1961) and Mickey Mantle (29 in 1961). Credit: Elias Sports Bureau...Hit third-inning grand slam (#27) in the third and was 1-for-4 with 1IBB in 7/9 loss at Tampa Bay...was his 11th career grand slam and first since 9/23/03 at Chicago (AL)...did not play in 8/9 win at Chicago with bruised right elbow...hit two-run HR (#33)-surpassing his 2005 total of 32-and was 1-for-4 with 1BB in 8/10 loss at Chicago...scored the 1,000th run of his career and was 2-for-4 with 3RBI and 2BB in 8/18 Game One win at Boston...hit three-run HR (#35) and game-winning solo HR (#36) in the 10th and was 3-for-4 with double, 5RBI and SF in 8/20 win at Boston...was his fourth multi-HR game of the season and the 34th of his career (all two-home-run games)...Missed three games with inflammation of left wrist (9/9-11 at Baltimore)...hit two-run HR (#37) and was 3-for-5 with a season-high 3R and 4RBI in 9/27 win vs. Baltimore...missed previous six games (9/20-26) with tendonitis and a small ligament tear of his left wrist...underwent MRI and CT scan of his left wrist on 9/21...hit .125 (1-for-8) with 1HR and 2RBI in three Division Series games vs. Detroit. Re-emerged as a prolific offensive force in 2005 and was named the American League "Comeback Player of the Year", hitting .271 (113-for-417) with 32HR and 87RBI in 139 games with the Yankees (78 starts at first base, 58 at designated hitter)...ranked first in the American League with a .440 on-base percentage and 108 walks, and fourth with 19 HBP...was batting a season-low .195 (15-for-77) with 3HR and 6RBI in his first 27 games of the season (from 4/3-5/9)...hit .288 (98-for-340) with 29HR and 81RBI in final 112 games (5/13-10/1)...missed two games (5/1-2) with tightness in his right forearm...missed three games (on 5/5-7) after being hit in the head by a pitch in the eighth inning on 5/4 at Tampa Bay...batted eighth in seven straight starts from 5/8-17 (had not batted eighth since 5/12/97-with Oakland-vs. Baltimore)...Was 3-for-4 with solo HR (#4) and two RBI singles in 5/17 win at Seattle...his sixth-inning solo home run snapped stretch of 56 homerless at-bats, his longest such streak since he had 70 homerless at-bats from 6/22-9/17/04...was scratched from the lineup on 6/8 at Milwaukee with back spasms...hit two-run "walk-off" HR (#5) in the 10th and was 2-for-5 in 6/15 win vs. Pittsburgh...was his third career "walk-off" home run (second as a Yankee, last on 5/17/02 vs. Minnesota)...hit game-winning "walk-off" two-run single in the ninth and was 1-for-4 with 1BB in 6/26 win vs. NY Mets...hit two solo HRs in 7/4 win vs. Baltimore...Hit solo HR in the second to become the 33rd player to hit 100 home runs as a Yankee...also hit solo HR in the eighth for his 24th career two-home-run game and his first since 7/18/03 vs. Cleveland...hit two solo home runs (#s 14,15) in 7/21 loss at Los Angeles-his second straight multi-home-run game and third of the season-to become only the second Yankee in the last 30 years to hit two or more home runs in two consecutive games...he joined Paul O'Neill, who hit two HR on 9/9/98 at Boston and on 9/10/98 vs. Toronto (credit: Elias Sports Bureau)...hit solo home runs in the second and seventh (#18, 19)-his fourth multi-home-run game of the season-and was 2-for-3 with 3R and 3BB (1IBB) in 7/31 win vs. Los Angeles...his second home run of the game was the 300th of his career. 4 Was named the American League "Player of the Month" for July...in 26 games, Giambi batted .355 with 24RBI while leading the league with a .974 slugging percentage, a .524 on-base percentage, and 74 total bases...his Major-League leading 14 home runs in July were the most in a month by a Yankee since Mickey Mantle hit 14 in July of 1961...according to Elias Sports Bureau, no Major Leaguer had hit as many as 14 home runs in a calendar month and posted a .350-or-higher batting average since August 2001, when Sammy Sosa batted .385 with 17 home runs...also recorded four multi-home-run games in the month...was his fifth career "Player of the Month" Award, his third as a member of the Yankees...hit two solo-HRs (#20, 21)-including the game-winner in the ninth-and was 3-for-4 in 8/4 win at Cleveland...Had four multi home run games over a 14-game span from 7/20-8/4...only five other players in Major League history had four multi-home-run games over a span of 14 team games (Mel Ott, Harmon Killebrew, Frank Howard, Albert Belle and Barry Bonds) - credit: Elias Sports Bureau...hit 16 home runs in 26 games from 7/4-8/4, the most in the Majors over that span...prior to 7/4, hit only one home run in his previous 31 games...became the fourth player in Yankees history to hit at least 16HR over a 26-game span, joining Roger Maris (1961-17HR); Babe Ruth (1927-16HR) and Mickey Mantle (1961-16HR) - credit: Elias Sports Bureau...Reached base safely (via hit, BB or HP) in 27 straight games from 6/23-7/27...was his longest streak since reaching base safely in 37 straight games in 2003...snapped 0-for-21 stretch with a fourth-inning single on 8/22 vs. Toronto...was the longest hitless streak since 7/11-9/17/04 when he went hitless in 32 consecutive at-bats...equaled his single-game career high with seven RBI in 8/28 win vs. Kansas City, going 3-for-3 with 2R, 2HR and 1BB before being replaced defensively in eighth...Recorded his 1,000th career RBI with a third-inning, three-run HR and his 1,500th career hit with a fifth-inning two-run HR...with two-run, sixth-inning single, recorded the third seven-RBI game of his career and first since 9/15/00 (with Oakland) at Tampa Bay...hit solo HR in the fifth inning and game-winning three-run HR in the sixth in 8/29 win at Seattle, his second straight multi-home-run game...according to the Elias Sports Bureau, he became the first American Leaguer ever to have multi-home-run games in consecutive team games twice in the same season and the seventh Major Leaguer (first since Barry Bonds on 7/30-31 and 8/30-31/99)...Hit two home runs in each of the last four games in which he homered, becoming the first player in Major- League history to do so...was his seventh multi-HR game of the season-all since 7/4-and now has 30 in his career...homered in three consecutive games on 9/10-11 vs. Boston and 9/13 at Tampa Bay for second time this season and for 12th time in his career (also homered in three straight games on 7/4-5 vs. Baltimore and on 7/7 vs. Cleveland)...had season-high nine-game hitting streak from 9/3-14, batting .394 (13-for-33) with 5HR and 15RBI during the stretch...reached base in 15 of his last 25 plate appearances of the season (4-for-14, 10BB, 1HP)...hit .421 (8-for-19) with three doubles and 2RBI in five Division Series games. Hit .208 (55-for-264) with 12HR and 40RBI in 80 games with the Yankees (47 starts at firstbase, 28 at designated hitter)...was elected to the 2004 American League All-Star Team, the fourth All-Starselection of his career (2000-'02; 2004)...hit two-run HR in 3/30 Opening-Day loss vs. Tampa Bay at TokyoDome, his third career Opening-Day home run (first with the Yankees)...became the 54th player in franchisehistory to homer on Opening Day (86 total home runs)...did not start on 5/14 vs. Seattle because of mild bursitisin his right hip (pinch-hit and drew IBB)...missed two games (5/16 vs. Seattle and 5/18 at Anaheim) aftersuffering slight strain of upper left back on 5/15...was placed on the 15-day disabled list for the first time in hiscareer from 5/22-6/6 with a sprained right ankle (missed 12 games)...was injured in 5/21 loss at Texas whilerounding first base on a ninth-inning single...returned to line-up on 6/6 vs. Texas and was 1-for-4 with aneighth-inning solo-HR (#10)...did not start in eight straight games from 6/26-7/4 (was diagnosed with an intestinalparasite on 6/29)...was placed on the 15-day disabled list for a second time in 2004-the second time inhis career-on 7/30 with a benign tumor (retroactive to 7/24)...was cleared to resume baseball-related activitieson 8/10 and reported to the Yankees' Player-Development Complex in Tampa...concluded minor-leaguerehab assignment with Triple-A Columbus on 9/13, going 2-for-16 with 2 doubles (in 5GS at DH) in a five-gameseries vs. the Richmond Braves in the International League playoffs...was returned from his rehab assignmentand reinstated from the 15-day disabled list prior to 9/14 gameat Kansas City...hit two-run HR (#12) and was 1-for-3 with3RBI and 1SF in 9/21 win vs. Toronto...his second-inninghomer snapped a career-long 0-for-32 stretch (previous longwas 0-for-25 from 8/24-9/6/03)...it was his first home runsince 6/20/04 at Los Angeles (off Eric Gagne), a span of 23games...was 4-for-33 in his final 10 games of the season afterbeing reinstated from the 15-day disabled list on 9/14...wasnot placed on the ALDS or ALCS roster. Hit .250 (134-for-535) with 97R, 41HR and 107RBI in 156 games with the Yankees (85 startsat first base, 69 at designated hitter)...ranked first in the A.L. with 129 walks, 21 HBP, third with a .412 on-basepercentage, fourth with 41 HR, and ninth with 107 RBI...with 129 walks, became the fourth player in franchisehistory to draw at least 120 walks in a season, joining Babe Ruth (10 times), Lou Gehrig (four times) and MickeyMantle (four times)...has third-highest HR total of any Yankee in his first two seasons (82), behind only BabeRuth (113) and Roger Maris (100)...has hit 30 or more home runs in each of the last five seasons (1999-2003)and has reached the 100RBI plateau in six straight seasons (1998-2003)...led the Major Leagues with 29 homeruns on the road in 2003...only three Yankees have ever hit more road home runs in a season: Babe Ruth (32in 1927), Roger Maris (31 in 1961) and Mickey Mantle (30 in 1961)...became only the fourth Yankee to recordmultiple 40-home-run seasons, joining Babe Ruth (11 times), Lou Gehrig (5) and Mickey Mantle (4)...with a .250batting average and 107 RBI, became only the fifth player in franchise history to drive in 100 runs in a season with an average below .260...the four others: Danny Tartabull in 1993 (.250 BA/102 RBI), Joe Pepitone in 1964 (.251 / 100), Graig Nettles in 1977 (.255 / 107), and Roger Maris in 1962 (.256 / 100)...was selected to 2003 American-League All-Star team (replacing injured Mike Sweeney), his fourth All-Star selection...hit solo-HR off Billy Wagner in his only AB...hit two solo HR in 4/1 win at Toronto, the 20th multi HR game of his career and first since 9/24/02 at Tampa Bay...missed two games (5/10-11) at Oakland with inflammation of left eye...suffered bruised left middle finger on HP on 4/23 at Anaheim and did not start next game on 4/24 (pinch hit for Wilson with bases loaded in sixth inning and struck out)...with his 20th home run in the 77th game of the season on 6/26 at Tampa Bay, joined Alfonso Soriano to become the first pair of Yankee teammates to reach 20 homers in the first 80 games of the season since Mickey Mantle and Roger Maris in 1961...was named American-League bPlayer of the Monthb for June...batted .373 (31-for-83) in 27 games with 11HR, 29RBI, and led the A.L. in slugging (.819) and on-base percentage (.554), and tied for the lead with 27R while drawing 33BB...has now been named Player of the Month four times in his career (5/02, 5/01, and 9/00)...hit 11HR in June, the most by a Yankee in any calendar month since TinoMartinez hit 11 in May, 1997 (no Yankee has hit more than 11HR in any month since 1961 when Mickey Mantlehit 14 and Roger Maris hit 13 in July)...snapped his streak of reaching base safely in 37 consecutive games on7/1 at Baltimore (was his longest such streak since he reached base safely in a career-high 39 straight gamesfrom 8/12-9/25/98)...in ninth inning of 7/7 win vs. Boston, became first Yankee to receive IBB with bases emptysince Reggie Jackson in 1980....homered in three straight games from 7/11-13 for the eighth time in his career(last from 8/25-28/01 w/ Oakland)...hit two-run HR (#27) in the third and solo HR (#28) in the seventh in 7/18win vs. Cleveland, his fourth two-home-run game of the season and the 23rd of his career...was 1-for-3 withsolo HR (#36) and 1BB in 9/3 loss at Toronto, snapping 0-for-25 stretch with fourth-inning solo HR...the 0-for-25 stretch was the longest of his career (was 0-for-22 in 1996) and the longest by a Yankee since Rondell White went 0-for-26 in 2002...hit solo-HR (#37) in the fifth and was 4-for-5 with 1R, 1 double and 2RBI in 9/12 winvs. Tampa Bay...was his second four-hit game of the season (also 5/27 vs. Boston) and his first game of atleast three hits since 8/5 vs. Texas...batted .237 (14-for-59) with 4HR and 6RBI in 17 postseasongames...became the first Yankee to record a multi-home-run game--in Game Seven of the ALCS vs. Boston--since Chad Curtis also hit two home runs in Game Three of the 1999 World Series on 10/26/99...also becamethe third Yankee to record a multi-home-run game in ALCS play, joining Graig Nettles (in Game Four of the 1976ALCS vs. Kansas City) and Darryl Strawberry (in Game Four of the 1996 ALCS at Baltimore)...was the first multi-HR game in ALCS play since Adam Kennedy hit three home runs in the clinching Game Five of the 2002 ALCSat Anaheim...batted seventh in Game Seven of the ALCS, the lowest he has started a game in the batting ordersince 7/15/99 (w/ Oakland) vs. San Francisco, when he also hit in the 7th position in the batting order...hit the19th pinch-hit home run in World Series history and seventh by a Yankee in the ninth inning of Game Five atFlorida on 10/23...was his first career World Series homer and first ever pinch-hit home run. Continued his ascent as one of Baseball's most prolific offensive forces in his first season as a Yankee...batted .314 (176-for-560) with a career-high 120R, 41HR and 122RBI in 155 games (92 starts at first base, 63 at designated hitter)...ranked second in the A.L. in walks (109), third in on-base percentage (.435), fourth in HR (41), runs (120) and slugging percentage (.598), fifth in RBI (122), and sixth in batting (.314)...batted .274 (29-for-106) with 4 HR and 15 RBI in his first 28 games with the Yankees...in his final 127 games of the season, batted .324 (147-for-454) with 37 HR and 107 RBI...with 41 HR, had the second highest home run total in his first year as a Yankee behind Babe Ruth (54 in 1920)...with his brother Jeremy, combined to hit 61 home runs in 2002 to break theMajor-League record for most homers in a single season by brothers (59 by Joe DiMaggio, 46; and Vince DiMaggio, 13;in 1937)...was elected to his third consecutive All-Star Game...started All-Star Game on 7/9 at 1b and was 1-for-2with 1R...hit first two HR as NYY-for his 16th career multi-HR game-in 4/10 loss at Toronto...hit game-winning walkoffgrand slam in the 14th inning on 5/17 vs. Minnesota, only the 21st time that a player has done so with his team trailingby three runs and only the second time by a Yankee (also Babe Ruth on 9/24/25)...was his ninth career grand slam(first as a Yankee) and his second walk-off HR (also 8/12/01 with Oakland vs. the Yankees)...played in his 1,000th Major-League game on 5/22 vs. Toronto...hit solo-HR (#13)-the 200th of his career-in the second and hit game-winning 3-run HR (#14) in the ninth and was 3-for-5 in 5/29 win at Chicago...was his 17th career multi-homer game (second as a Yankee)...was named A.L.Player-of-the-Month for May...in 28 games, batted .340 (36-for-106) with 26R, 10 doubles, 10 HR, 24 RBI, 19BB, a .717 slugging percentage, and a .449 on-base percentage...was his third Player-of-the-Month Award andhis first as a Yankee (also September of 2000 and May of 2001)...his 10 home runs in the month of May ledthe A.L. and was his highest single-month total since hitting a career-high 13 in September of 2000 and the most by a Yankee since Tino Martinez hit 10 in July of 2001...was scratched from 6/21 lineup with a bruised rightthumb (suffered on 6/20 at Colorado in catcher's pick-off attempt)...hit solo-HR (#20) and 2-run HR (#21) andwas 2-for-4 in 6/27 win at Baltimore...was his third multi-HR game of the season and 18th of hiscareer...equaled season high with four hits in 7/24 win at Cleveland (third time) and became 11th Yankee toscore five runs in a single game (14th time and first since Tino Martinez on 4/2/97 at Seattle)...reached the 100-RBI plateau for the fifth consecutive season with a run-scoring single in 8/26 win vs. Texas...batted .357 (5-for-14) with 1HR and 3RBI in four games in the American League Division Series versus Anaheim. Enjoyed another stellar campaign, finishing second to the Mariners Ichiro Suzuki in the American-League Most Valuable Player voting...led the league in walks (129), doubles (47), on-base percentage (.477), slugging percentage (.660) and times on base (320) while tying for the league lead in extra base hits (87) and finishing second in batting (.342) and intentional walks (24)...his .342 average set an Oakland record, topping Carney Lansford's .336 in 1989, and was the highest batting average by an Athletic in 50 years (Ferris Fain, .344 in 1951)...Became just the ninth player in Major-League history to increase his batting average in six or more consecutive seasons...his .308 career average is the highest in Oakland history...with on-base percentages of .476 in 2000 and .477 in 2001, became the first player to post on-base averages of .475 or better in each of two consecutive seasons since Ted Williams did it in four straight years from 1954-57...set Oakland records in doubles, on-base percentage, extra base hits and intentional walks...his 24 intentional walks were also a franchise record and the on-base percentage topped his franchise record of .476 which he set last year...Ranked third in the AL in total bases (343), sixth in runs (109), seventh in home runs (38), eighth in RBI (120), tied for eighth in hit by pitches (13) and tied for 10th in hits (178)...his walks and slugging percentage were second best in Oakland history, the total bases were third most, the RBI were fifth most, the hits were eighth most, the runs were ninth most and the home runs tied for 10th most...was first player in Oakland history and the fourth (Simmons, Johnson, Foxx) in Athletics history with four straight 100 RBI seasons...Led the A's in batting, slugging, on-base percentage, runs, hits, doubles, home runs, RBI and walks...became first player in Oakland history to lead the team in batting five consecutive seasons and the third in Athletics history (Simmons, eight straight seasons from 1924-31; and Collins six straight from 1909-14)...became the first player in Oakland history to lead the team in RBI five straight seasons and the fourth in Athletics history (Johnson 7 from 1936-42, Al Simmons 7 from 1925-31, Gus Zernial 5 from 1951-55)...holds the top three home batting averages in Oakland history (.353 in 1999 and .349 in 2000)...hit 27 of his 38 home runs in Oakland to set a Coliseum single season home run record, breaking Reggie Jackson's mark of 26 set in 1969...was 8-for-14 (.571) with the bases loaded and hit his eighth career grand slam on 4/24 at Chicago...committed his first error of the season in his 45th game at first base, snapping a 70-game errorless streak dating back to 8/11/00...Led the majors in batting in the month of May (.384) and topped the AL with a .504 on-base percentage to earn AL Player-of-the-Month...was his second monthly honor (also 9/00)...was named to his second consecutive All-Star team and was 0-for-1 with 1 R in the game in Seattle...walked on 7/16 vs. Colorado to snap a 10-game streak with no walks, the second longest such streak of his career (11, 9/8-19/97)...homered in three consecutive games twice in August (8/10-12 and 8/25-28) and four times for the season (5/30-6/1 and 7/13-15)...recorded his 1,000th career hit on 8/12 against New York as his two-out, two-run home run in the bottom of the ninth inning off Mike Stanton broke a 2-2 tie in a 4-2 A's win...Had a season best 11-game hitting streak from 8/24 to 9/5 (.455, 15-for-33) and concluded the regular season batting .406 (37-for-91) with 9 HR and 25 RBI over his final 29 games...in addition to being the A's career leader in batting, he also ranks first in on-base percentage (.412), second in slugging (.545), third in doubles (228), fifth in home runs (187) and RBI (675), tied for fifth in extra base hits (422), sixth in walks (586) and total bases (1851), ninth in runs (601) and tied for ninth in hits (1048). Capped off his finest season to date by being named American League Most Valuable Player by the BBWAA...joined Vida Blue (1971), Reggie Jackson (1973), Jose Canseco (1988), Rickey Henderson (1990) and Dennis Eckersley (1993) as one of six Oakland MVP's...led the major leagues in walks (137) and on-base percentage (.476) and tied for the lead with four grand slams, the most in Athletics (1901-2000) history...ranked among the American League top 10 in home runs (43, t- 2nd), slugging percentage (.647, 3rd), RBI (137, t-4th), batting (.333, t-7th), total bases (330, 8th) and runs (108, t- 10th)...finished second to Colorado's Todd Helton in the Associated Press Major League Player-of-the-Year voting and was named to his first AL All-Star Team...had one of the finest seasons in Oakland history as he set Oakland single season records in RBI, walks and on-base percentage...his .476 on-base percentage also set an Athletics franchise (1901-2000) record, topping Jimmie Foxx's .469 in 1932...his 137 RBI ranked seventh most in franchise history and was the most in 67 years when Jimmie Foxx had 163 in 1933...his 137 walks were second in franchise history only to Eddie Joost's 149 in 1949...his .333 batting average was second best in Oakland history to Carney Lansford's .336 in 1989 and his .647 slugging percentage was second best to Mark McGwire's .730 in 1996...his average did break his own Oakland record for a left-handed hitter and was the highest by an Athletics left hander since Ferris Fain hit .344 in 1951...became the fourth player (seventh time) in Oakland history to hit 40 home runs in a season...had career highs in total bases (330)...his average, RBI and walk totals have increased in each of his six major league seasons and his home run total has never decreased...is the second player in Oakland history with three straight 100 RBI seasons (Jose Canseco, 1986-88), the second player (third time) with back-to-back seasons of 100 or more runs (Rickey Henderson, 1982-84 and 90-91), the fourth player (sixth time) with back-to-back 30 home run seasons and the fourth player to walk at least 100 times in consecutive seasons...was the only player in Oakland history to have two seasons with at least 100 walks, 100 runs and 100 RBI in the same season...ranked sixth in the American League with a .356 (42-for-118) average with runners in scoring position...hit .636 (7-for-11) with the bases loaded...became the first Oakland player to lead the team in batting four consecutive seasons...became the fourth player in Athletics history to lead the team in hitting in at least four consecutive seasons (Eddie Collins six times from 1909-14, Al Simmons eight times from 1924-31, Jimmie Foxx four times from 1932-35)...was the first Oakland player to lead the team in RBI in four consecutive seasons, the seventh in franchise history...became the first player in Oakland history to hit two home runs on opening day, 4/3 vs. Detroit...was his first of five two-homer games in 2000...hit his first of his franchise record four grand slams on 4/9 vs. Chicago and now has seven in his career...hyper extended his right knee on 4/14 and did not play on the next day, the only game he would miss over the A's first 120 games...finished April with 9 HR and 27 RBI, then hit 7 HR in his first 13 games in May and had 16 home runs and 46 RBI over his first 37 games which led the American League...committed his first error of the season on 5/6, snapping a 69-game errorless streak at first base dating back to 8/1 of 1999...finished with six errors and ranked fourth among American League first basemen with a .995 fielding percentage...on 6/7 vs. San Diego was 4-for-4 with 2 HR and a career high 7 RBI...that began an incredible 19-game stretch where he hit .541 (33-for-61) with 25 walks (.678 on-base percentage), 10 doubles, 5 HR, and 23 RBI...had four games during that streak where he was not put out and two streaks where he reached base safely in 10 consecutive plate appearances (6/13-16 and 6/21-24)...stole home on 6/11 at Los Angeles, the 39th steal of home in Oakland history...finished June with a .450 average, one of three times he has hit .400 in a month (.404, August of 1999 and .400, September of 2000)...led the majors with 30 walks in June...started at first base in the All-Star Game and was 0-for-2 with 1BB...was the first A's player voted in by the fans since McGwire and Canseco in 1992...had 78 RBI at the break which tied for third most in Oakland history, three short of Reggie Jackson's record of 81 in 1973...compiled a .347 batting average with 40 HR and 150 RBI from the All-Star Break in 1999 to the ASB in 2000...recorded his 500th career RBI on 7/17 at Colorado and snapped a season-long 51 at-bat homerless streak the next day against the Rockies...homered in three consecutive games, 8/10-12...recorded his 100th RBI of the season on 8/12 vs. Detroit, the earliest in Oakland history a player has reached 100 RBI..b&suffered an anterior left shoulder strain on 8/14 vs. Cleveland and missed eight of the A's 13 games from 8/19-9/1...received a cortisone shot following the game on 8/30 and went on to hit .400 (38-for-95) in September with 26 R, 13 HR, 32 RBI, 25 BB, an .853 slugging percentage and a .529 on-base percentage in 27 games...was named AL Player-of-the-Month in September, the first Oakland player to win the award since Mark McGwire in June, 1996...led the American League in home runs, on-base percentage and slugging percentage in September and ranked second in RBI, tied for second in walks, third in batting and tied for third in runs...the home runs were his most ever in a month and two short of Mark McGwire's Oakland single month record of 15 set in May of 1997...the 32 RBI were also his most ever in a month...had two two-homer games in a four-game span, 9/9 vs. Tampa Bay and 9/12 vs. Minnesota...tied his career high with 7 RBI on 9/15 at Tampa Bay when he hit his franchise record fourth grand slam...earned American League Co-Player-of-the-Week honors with Manny Ramirez the week of 9/11-17 as he hit .625 with 3 HR and 12 RBI...hit his 40th home run of the season on 9/25 vs. Anaheim and finished the season by homering five times in his last eight games...hit .286 with 7BB in five starts at first base in the Division Series against New York...batted .348 (147-for-422) with 38 HR and 121 RBI in 124 starts at first base compared to .259 (22-for-85) with 5 HR and 15 RBI in 24 starts at designated hitter...36 of his 43 home runs came off right handers. Posted career highs in games (158), runs (115) and hits (181)...topped the club in batting (.315), runs, hits, doubles (36), RBI (123) and walks (105)...ranked among the American League top 10 in walks (2nd), RBI (t-6th), on-base percentage (t-7th, .422), runs (9th) and extra base hits (t-10th, 70)...he and Manny Ramirez were the only American Leaguers who finished in the top 10 in all five of those categories...hit .353 (98-for-278) at home to set an Oakland record for highest home batting average, ranking him fifth in the AL...led the A's in average with runners in scoring position (51-for-163, .313) for the third consecutive season...batted .361 (97-for-269) in 74 games after the All-Star Break with 18 HR and 72 RBI...his batting average was second best in the majors after the All-Star Break to Ivan Rodriguez (.369) and his RBI tied for second with Rafael Palmeiro to Mark McGwire's 75...was batting just .186 (19-for-102) with 2 HR and 6 RBI against south paws at the break but then hit .405 (32-for-79) with 6 HR and 31 RBI vs. lefties the second half of the season...finished the year with a .282 mark against left handers and his .330 mark against right handers tied for ninth in the American League...was the A's Opening Day starter at designated hitter but made 140 starts at first base for the season...began an A's season high 18-game hitting streak on 6/23 at Kansas City with a grand slam, his second of the season...then hit a pair of three-run home runs the next night for a then career high six RBI...it was his third of four two-homer games in 1999...hit .465 (33-for-71) during the hitting streak, his fifth of 15 or more games in his career...no other player in Oakland history has more than four...batted an American League leading .404 (40-for-99) in August and also topped the circuit with 12 doubles...snapped a season high 20-game, 73-at-bat homerless streak on 9/5 vs. Detroit and then hit his 100th career home run the next night off the Tigers Jeff Weaver...led the A's in multiple hit games (46), multiple RBI games (31) and game-tying/go-ahead RBI (32)...was tied for second among American League first basemen with a .995 fielding percentage (seven errors in 1303 total chances). Led the team in batting (.295), home runs (27) and RBI (110) to become the fifth player (sixth time) to win an Oakland triple crown...had hitting streaks of 17-and 16-games to become the first player in Oakland history with two hitting streaks of 15 or more games in the same season...hit .319 in April, including the first of two two-homer games on 4/16 vs. Kansas City (also on 8/23 vs. Detroit)...then went 21-games and 83-at-bats before belting his next homer on 5/12 at Toronto...went another 23-games and 83-at-bats before homering in consecutive games, 6/7-8...had a streak of five straight multiple hit games from 6/20-24 and finished the season with a team leading 45 multiple hit games...then went on to bat .340 in July which included his 17-game hitting streak from 7/16-8/2...suffered a mild concussion on 8/4 in the ninth inning of the second game of a doubleheader vs. New York when he was hit in the head by Derek Jeter's knee on a play at first base...missed just one game but had a season long 0-for-17 slump after his return...had batted fifth for most of the season but was inserted into the three spot in the order on 8/15 and made each of his last 39 starts there...batted .289 with 12 HR and 55 RBI when batting fifth and .320 with 10 HR and 37 RBI when hitting third...recorded his 500th career hit on 9/8 with a fifth inning single off Doug Johns...that was part of his 16-game hitting streak from 9/5-24...streak was part of a career high tying 39-game stretch where he reached base safely via hit or walk in each game from 8/12-9/25...led the A's with a .309 (51-for-165) average with runners in scoring position...was the only Athletic to improve his batting average after the All-Star break as he hit .283 before the break and .309 after the break...committed an Oakland record 14 errors at first base which led the league and was the most by an Athletics first baseman since Eddie Robinson made 17 in 1953 with Philadelphia...his .990 fielding percentage was second lowest among American League first basemen...played on the Major League All-Star team that toured Japan during the off-season and hit .385 with a home run in six games. In his second full season in the Majors and batted .293 with 20 HR and 81 RBI in 1997...broke his own club record for doubles with 41 and became the fourth player in Athletics history with 40 doubles in consecutive seasons, joining Al Simmons (1925-26 and 29-30), Frank Baker (1911-12) and Harry Davis (1905-06)...started slowly as he was batting .248 entering play on 5/12...doubled that night against Baltimore to start an Oakland record 25-game hitting streak that lasted through 6/23...hit .409 (38-for-93) during the streak to break Carney Lansford's previous record of 24 set in 1984...hit his first career grand slam on 5/22 at Texas off John Burkett and 14 of his 20 home runs came with men on base...10 of his home ...........	runs either tied the game or put the A's ahead as did 28 of his 81 RBI...finished May with a team leading .353 batting average and followed that up by hitting .364 in June...was hitting .302 on 7/10 which would be his last day over .300 for the season...had seven straight multiple hit games from 8/31-9/7 and posted his second career two homer game on 9/20 vs. Seattle...finished September with a .366 average, his third month in 1997 over .350...led the team with 66 runs scored, 152 hits and 44 multiple hit games and tied for the team lead with 81 RBI and 21 multiple RBI games...began the season as the A's left fielder, starting 30 of the A's first 32 games in left...13 of his next 15 starts came at DH before he returned to left field...moved to first base following the McGwire trade on 7/31 and started 47 of the A's final 53 games at first...for the season, made 67 starts in left, 48 at first and 22 at designated hitter. In his first full season in the Majors, batted .291 with 20 HR and 79 RBI in 140 games while starting games at five different positions (LF, 1B, 3B, DH, RF)...by starting 43 games in left, 42 at first and 38 at third, he became the first player in Oakland history to start at least 30 games at three different positions...set what was then an Oakland record with 40 doubles...was one of five A's with 20 homers, hitting his 20th on 7/26 at Toronto...did not homer the rest of the way, a span of 43 games and 154-at-bats...began the year as the A's first baseman while McGwire was injured and had a 19-game hitting streak in April that had his average at the .344 mark for the month...included in the streak was a stretch where he went 8-for-8 with 4 BB and 1 SF from 4/20-23...made his first professional appearance in the outfield with a start in right at Kansas City on 5/4...he then took over as the A's starting third baseman on 5/5, starting 38 of the A's next 47 games at third base due to an injury to Scott Brosius...earned AL Player-of-the-Week honors for the week of 5/6-12 by hitting .538 with 5 doubles, 1 HR, 5 RBI and 8 runs scored...hit the 4,000th home run in Oakland history on 5/17 at Boston off of Tim Wakefield...moved to left field following the return of Brosius and immediately homered in four consecutive games from 6/25-29...had an Oakland record tying five hits on 7/2 at Seattle...was hitting .323 at the All-Star Break but batted just .245 after the break...average was at the .305 mark on 9/10, but he then went 1-for-28 over his final nine games to finish the year at .291...missed the final seven games because of a sprained right wrist. Made his major league debut with the A's in 1995 with two separate stints in Oakland...began the year at Triple-A Edmonton but was recalled to Oakland on 5/8 when Mike Bordick was injured...made his Major-League debut that night with a start at DH vs. Texas and picked up his first major league hit with an eighth inning single off of Roger Pavlik...went 2-for-11 in four games and was optioned back to Edmonton on 5/15 when rosters were cut back to 25...while at Edmonton, he hit .342 with 26 doubles and 41 RBI in 55 games as the Trappers third baseman...came back to Oakland for good on 7/7 and hit his first Major-League home run the next day off of Toronto's David Cone...homered in three consecutive games at Kansas City 8/14- 16...injuries limited his playing time over the final six weeks of the season, missing five games with a strained hamstring, seven games with a mild concussion suffered on 8/26 in Boston and the final eight games with a sore right rib cage...split his playing time between third base (26 starts) and first base (20 starts) and he also made two starts at DH...was one of the A's top clutch hitters, batting .313 with RISP and upping his average from .235 in innings 1-6 to .298 from the seventh inning on...came to the plate 11 times with a runner on third and less than two outs and knocked the runner in 10 times. Split his year between Double-A Huntsville and Triple-A Tacoma and had his best success at the higher level...opened the year in Huntsville, but when Craig Paquette was promoted from Tacoma to Oakland, Giambi moved up a step in the A's system...spent a month playing at Triple-A then returned to Huntsville on 6/29 when Paquette was optioned down from Oakland...belted two homers on 7/8 at Birmingham...after 18 games in Double-A made his second trip to Tacoma when Paquette fractured his ankle and finished the season there...with Tacoma was 18-for-56 (.321) with runners in scoring position and kicked that up to .346 (9-for-26) with runners in scoring position and two outs...spent the fall playing third base for the Arizona Fall League Champions, the Peoria Javelinas, and hit .283 with two homers and 21 RBI in 39 games. Played the full year at Single-A Modesto of the California League and was the starting third baseman for the North squad in the California League All-Star Game played in June...went on the disabled list in late July with a sore right thumb and missed nearly a month of the season...finished at .291 on the season with 30 extra-base hits and 60 RBI in 89 games...spent part of the winter playing for the Kauai Emeralds of the Hawaiian League. Was the A's second round selection but spent most of his summer playing for the U.S.A. Olympic team that competed in Barcelona...returned from the Olympics in late August and was assigned to Single-A Southern Oregon of the Northwest League...in his 13 games at Southern Oregon he hit .317 with three homers and 13 RBI. October 30, 2014 DH Jason Giambi elected free agency. September 1, 2014 Cleveland Indians activated DH Jason Giambi from the 60-day disabled list. 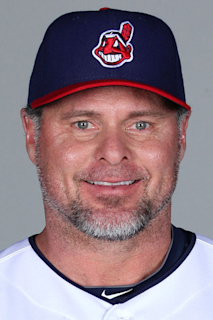 August 26, 2014 Cleveland Indians sent DH Jason Giambi on a rehab assignment to Akron RubberDucks. July 12, 2014 Cleveland Indians transferred DH Jason Giambi from the 15-day disabled list to the 60-day disabled list. May 20, 2014 Cleveland Indians activated DH Jason Giambi from the 15-day disabled list. May 5, 2014 Cleveland Indians placed DH Jason Giambi on the 15-day disabled list retroactive to May 4, 2014. Strained right calf. April 21, 2014 Cleveland Indians activated DH Jason Giambi from the 15-day disabled list. April 11, 2014 Cleveland Indians sent DH Jason Giambi on a rehab assignment to Akron RubberDucks. March 30, 2014 Cleveland Indians selected the contract of DH Jason Giambi from Columbus Clippers. October 31, 2013 Cleveland Indians signed free agent DH Jason Giambi to a minor league contract and invited him to spring training. October 31, 2013 DH Jason Giambi elected free agency. October 31, 2013 DH Jason Giambi assigned to Columbus Clippers. April 12, 2013 Jason Giambi elected free agency. April 12, 2013 Cleveland Indians activated DH Jason Giambi from the 15-day disabled list. March 25, 2013 Cleveland Indians selected the contract of 1B Jason Giambi from Columbus Clippers. February 9, 2013 Cleveland Indians signed free agent 1B Jason Giambi to a minor league contract and invited him to spring training. February 9, 2013 Jason Giambi assigned to Columbus Clippers. November 3, 2012 1B Jason Giambi elected free agency. September 1, 2012 Colorado Rockies activated 1B Jason Giambi from the 15-day disabled list. August 29, 2012 Tulsa Drillers sent 1B Jason Giambi on a rehab assignment to Colorado Springs Sky Sox. August 24, 2012 Jason Giambi assigned to Tulsa Drillers. July 24, 2012 Colorado Rockies placed 1B Jason Giambi on the 15-day disabled list retroactive to July 21, 2012. Viral Syndrome. August 12, 2011 Colorado Rockies activated 1B Jason Giambi from the 15-day disabled list. August 8, 2011 sent 1B Jason Giambi on a rehab assignment to Colorado Springs Sky Sox. July 26, 2011 Colorado Rockies placed 1B Jason Giambi on the 15-day disabled list. Strained left quadriceps. March 31, 2011 Colorado Rockies selected the contract of 1B Jason Giambi from Colorado Springs Sky Sox. February 2, 2011 Colorado Springs Sky Sox signed free agent Jason Giambi. January 17, 2011 Colorado Rockies signed free agent 1B Jason Giambi to a minor league contract and invited him to spring training. November 7, 2010 1B Jason Giambi elected free agency. January 28, 2010 Colorado Rockies signed free agent 1B Jason Giambi. November 5, 2009 1B Jason Giambi elected free agency. September 1, 2009 Colorado Rockies selected the contract of 1B Jason Giambi from Colorado Springs Sky Sox. August 24, 2009 Colorado Rockies signed free agent 1B Jason Giambi to a minor league contract. August 24, 2009 Jason Giambi assigned to Colorado Springs Sky Sox from Colorado Rockies. August 7, 2009 Oakland Athletics released 1B Jason Giambi.